CROW AGENCY - The descendants of Crazy Horse trotted across 360 miles of prairie for a chance to charge up Last Stand Hill early this morning. The 20 riders of the Great Sioux Nation Victory Ride set out June 9 from the Cheyenne River Sioux Reservation in South Dakota. They wanted to take a slow, contemplative path to the battlefield where their ancestors found victory 127 years ago. It was a chance to remind the tribe's young people of the one unmistakable outcome of the battle, rider Doug War Eagle said. Tuesday night the riders pitched tents in a cottonwood grove along the Little Bighorn River, about 400 yards from where Crazy Horse and his family camped. 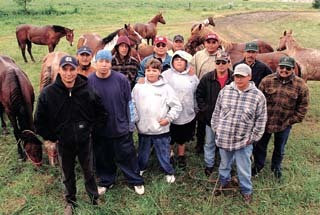 Not far away camps were filled with horsemen and women from other tribes. They will all be galloping across the battlefield today to mark the Indian Memorial dedication. Horses were vital in Plains Indian culture, and it's only fitting they play a starring role in the dedication, said Kitty Belle Deernose, curator of the battlefield museum. "Indian people are still very much a horse culture," she said. The Crow are sending 200 riders, including one riderless horse to honor Pfc. Lori Piestewa, a Hopi soldier who was mortally wounded in a March 23 ambush in Iraq. She was the first American Indian servicewoman killed in action. The Oglala Sioux have sent 39 riders. The Northern Cheyenne will decorate 20 horses before riding up to the monument to honor their fallen warriors. The Cheyenne-Arapaho tribes of Oklahoma have also sent a horse, Deernose said. Mel Lonehill, of Batesland, S.D., is part of the Oglala delegation, "Lokal Oyate Kawilau," which translates to "Gathering of the Traditional People." The group began riding on battle anniversaries 10 years ago. "We honor our ancestors by riding," Lonehill said. Horses came to the Plains Indians with the Spanish conquistadors. The Sioux called them the "holy dog," Lonehill said. "The horse came to our people and said he would travel with us if we would respect him." Re-enacting a horse charge up Last Stand Hill is an amazing feeling, Lonehill said. If the rider is focused and spiritually prepared, he can visualize oncoming enemy warriors, even with tourists as spectators. The Cheyenne River Sioux riders used their horseback journey to the battlefield as a chance to educate young people on traditional values. During the two weeks of the Great Sioux Nation Victory Ride, the descendants of Crazy Horse camped in sites once covered by their ancestors' teepees. They told stories each night and paid respects to their traditional allies, the Northern Cheyenne. A support crew drove ahead each day to set up camps. The riders raised their own money but received food and places to stay along the way. The horses spent every third day at rest in a trailer, said rider Scott Dupree. The riders weren't always so lucky. "I was sore by the time we got here," he said. 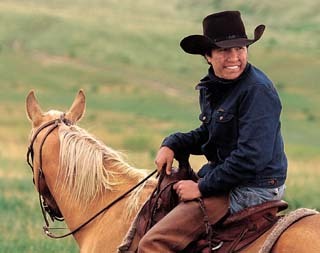 The days were long and hard, but spirits surged at the sight of the Deer Medicine Rocks outside of Lame Deer, said rider Floyd Clown. The group was given permission to camp next to the sacred rock formations, which bear prophetic drawings of the battle and the eventual murder of Sitting Bull. The ride was mostly to infuse traditional values in the young people, Clown said. Marking the Indian memorial dedication is just a side event. "Our monument is already there," Clown said. "That big, white monument up on Last Stand Hill shows our victory. It shows that our grandfathers were already here." Descendants of Crazy Horse gather near their horses as they prepare for today’s ride to the Little Bighorn Battlefield National Monument. They rode horses 380 miles to camp at their grandfather’s campsite and planned to cross the Little Bighorn River on horseback at sunrise today. Cheyenne Indian Louis Bear Quiver rode to a campsite near the Little Bighorn Battlefield National Monument to prepare for today’s activities. 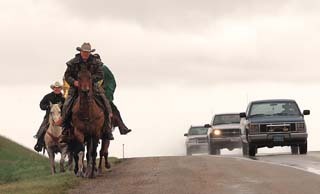 Cheyenne riders mix with traffic on Highway 212 near the Little Bighorn Battlefield National Monument. This article has been provided to the Custer Battlefield Museum with special permission granted by editor Steve Prosinski.